A ninth grade physics teacher's thoughts. 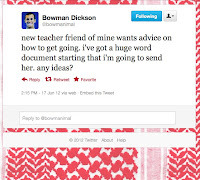 Khan II: Discussions and "Khanversations"
What's to Learn from Khan Academy? New Teacher Advice: Observe Others! 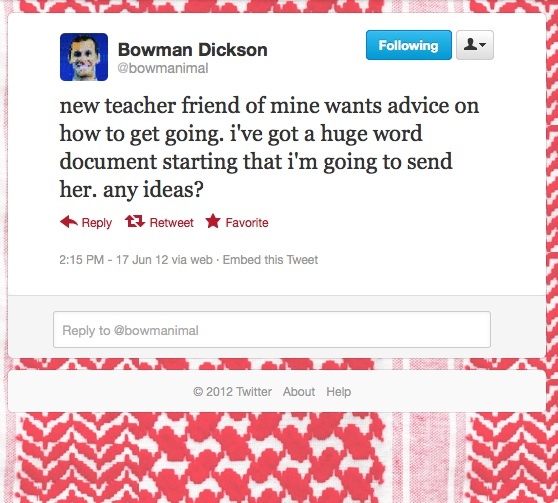 A couple days ago, a certain math teacher/blogger put out a "Call for Advice for New Teachers." The response has been amazing so far, and I'd wondered at first what I could possibly contribute... But I decided to mention something that's been on my mind a lot for the past couple years. I'll keep it quick, because lots of folks have already given remarkable advice, and and my suggestion is pretty simple: Every now and then, or even just once or twice during the year, sit in on another teacher's class and watch them teach. It doesn't have to be a teacher in your subject area, or someone who works with students who are the same age as yours. Simply getting out of your own class and into a fresh environment can be amazingly eye-opening. Lots of unexpected things can happen when you venture beyond the walls of your own classroom. If you witness students you teach working in another environment, for example, this can help you see their strengths in a different light and appreciate all the other classes they're taking simultaneously to yours. If you see students in a class that comes before or after yours in the school's year-to-year sequence, you'll get some perspective on where they're headed or where they've been. Heck, it doesn't even have to be a teacher who's all that fantastic. Some of the most valuable observations I've made have involved watching someone and cringing to myself, "Why, oh why, are they doing it this way??" and then realizing immediately afterward that I do exactly the same thing. The goal isn't necessarily to see models of how to teach effectively, although this will certainly happen. In my experience, it simply about shaking things up and giving yourself some fresh perspective. content by Joe Kremer. Powered by Blogger.